herself as one of the people who got arrested at the clinic. of following the word of God, "which says to rescue those who (are) unjustly sentenced to death." Edl, who said she's been arrested more than 40 times in the past, also is sensitive to the issue because of being sent to a "death camp" in the region later known as Serbia when she was a young girl, she said. when we were shipped in," she said. On Saturday, May 13, a historic rescue of preborn babies took place at the last remaining abortion clinic in the state of Kentucky. Coinciding with Mother's Day weekend, Operation Rescue National/Operation Save America exercised the biblical doctrine of interposition after a fifteen year hiatus. To draw attention to the plight of the victims, eleven Christians (including a concentration camp survivor, a pastor, a missionary to China, a great grandmother, and some young people) "rescued" babies scheduled to be murdered at 136 West Market St, Louisville, Kentucky. Members of Operation Save America were in Louisville May 13 to take a stand against abortion. 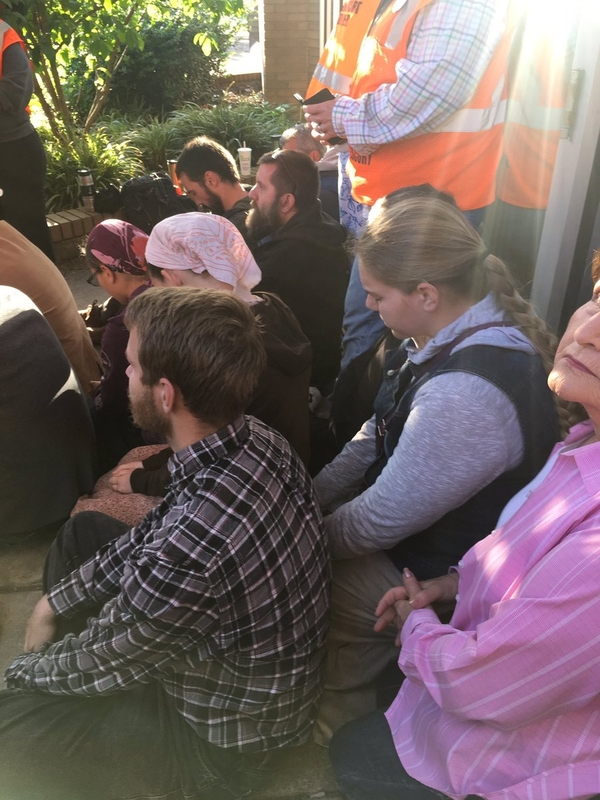 Ten people were arrested outside the EMW Women's Surgical Center in connection with their visit. Anti-abortion protesters were arrested for blocking the doors to Kentucky's EMW Women's Surgical Center Saturday morning. Louisville Metro Police responded to a call of people loitering in front of the clinic in the 100 block of East Market Street around 6 a.m. Saturday, an LMPD press release said. Officers saw 10 people who were locked arm in arm blocking the entrance to the clinic. After being asked numerous times to vacate the premises, they were arrested for trespassing, the release said. The anti-abortion campaign was led by Operation Save America, formerly known as Operation Rescue. Explaining their mission, the group's national director, Rusty Thomas, took issue with the word "protester." Thomas, who identified himself as one of the individuals who got arrested, said the group plans to return to the area in July to push for lawmakers to "ban all abortions in the state of Kentucky." "That is a tremendous opportunity before you all to become the first surgically abortion-free state in the United States of America and so, we’re praying Kentucky will lead the way out of this blood guiltiness that’s upon the land." Thomas spoke outside the Louisville Metro Department of Corrections, where members of the group had moved to show support for those who had been detained. [ CLL: Christian minister ] Joseph Spurgeon, a pastor with Sovereign King Church in Sellersburg, Indiana, and a member of the group, said the protest at the clinic was the organization's appeal to Gov. Matt Bevin to protect human life. He said the Louisville clinic was chosen because it is the last abortion clinic in Kentucky. The clinic had been facing a possible closure in a dispute with state officials over its license. Officials with the state Cabinet for Health and Family Services claimed the clinic didn't have proper agreements with a hospital and ambulance service in the event of a medical emergency. The clinic's Lexington location closed in January over its license dispute. But a federal judge signed off an agreement at the beginning of April to ensure the clinic remains open until the dispute over its license is resolved. Operation Save America "takes up the cause of preborn children in the name of Jesus Christ," according to its website. "Human life is human life from the moment of fertilization," said Eva Edl, who identified herself as one of the people who got arrested at the clinic. Edl, 82, of South Carolina said she joined the cause because of her love for Jesus Christ and of following the word of God, "which says to rescue those who (are) unjustly sentenced to death." "I just wish the good Christian people of my country would have gathered in front of my death camp when we were shipped in," she said.